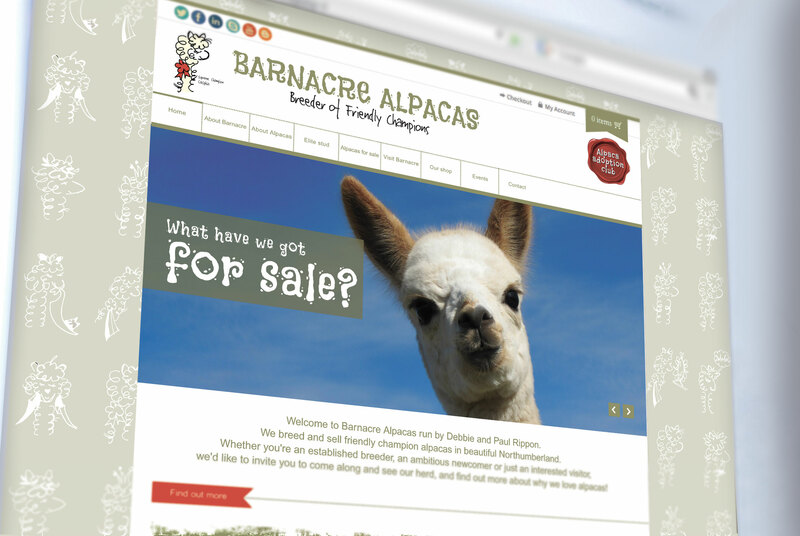 Barnacre Alpacas is, as you may expect, an Alpaca Farm based in Northumberland. Owned by Paul and Debbie Rippon, they breed and sell prize winning alpacas, and use their alpaca fleece to make products which they sell online and at various farmer’s markets and shows around the region. Their USP is that they breed not only prize-winning alpacas, but friendly ones too – a difficult trait to foster unless breeding and handling is managed very carefully. Beach was recommended to Paul and Debbie through another one of our customers. They had reached the stage where their home-grown marketing material didn’t reflect the quality of their offer, and they asked us to create a new identity for their already established brand and provide more professional-looking communication material to drive more sales. We worked with Debbie and Paul to identify their brand proposition and objectives, and pinpoint their promotional opportunities so we could design appropriate material. A targeted campaign followed, involving a variety of integrated marketing material primarily designed to attract more visitors to the website and then to the farm, for experience days. Their website and online shop was created to maximise content marketing opportunities by providing lots of useful knowledge and advice, along with reinforced ‘reasons to buy’ and clear communication of their total offer. We also worked with Barnacre to enhance their social media comms. Debbie already had an established following on blogger, so our remit involved enhancing the image of her existing blog, and considering alternative avenues for promotional opportunities. The business has continued to grow and now includes a commercial flock of sheep, angora goats, ducks and chickens.